Worked fine on a standalone (pioneer 383). If possible help spread. Feel free to post it anywhere. I honestly can't remember if this is a scifi or not... its like a horrory scifiy thrillerly thing right? It is supposed to be a thriller, Spud. I've watched that one a few months ago. Boring, I found. And it has nothing to do with science fiction. Nore horror... It's just supposed to be based on a true story that deals with premonitions. The end is just pathetic. All that money for that ! 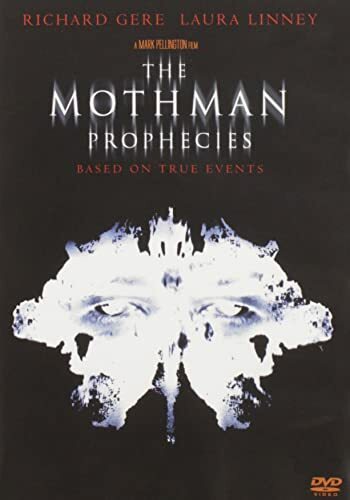 hmm i'm pretty sure i remember it was a scifi, the explaination behind the mothmen was something to do with powerlines or something wasn't it? infact weren't they aliens or transdimensional beings or something silly like that? Is this the one where they don't like the light? edit: imdb says it is at the very least, a scifi that is. You can't say its not a scifi because that would go against very rigid guidelines for what is scifi. Read the split @ hhah anyway, is very, very clearly is. The director claims it isn't too btw, but that's only because he's protecting his movie against being bottlenecked as a scifi flick which is a death blow for mass market appeal with titles like this. The reason he can claim this is that he stated it actually happened so its not a scifi Nut cases aside, a movie about the paranormal is a scifi, its one of the quantifiers for classifcation. And to be clear, its only the people who worked on the movie that have the crazy notion its not a scifi, and people keep asking them why and they fail to answer why it isn't. Which once again points to the fact that they don't want to be pigeon holded as making a scifi movie, and they are wrong, paranormal, as i've said umpteen times, is a scifi plot trait that means automatic classification as one. ie. why xfiles is scifi even when aliens aren't involved, and why buffy is also scifi, even if both are horror/drama and whatever else too. What is wrong, I believe (and this is where opinion enters) is to ever classify scifi as the main genre because quite frankly, that's not what scifi means as a real genre, instead the main classification is the standard genres, like horror, action, adventure whatever, and scifi because it meets the quantifier for classification. Unfortunately over the time scifi has been around, they've clouded it up and you get the "oh it needs aliens to be scifi" people, etc. In reality, if a main plot device, or setting goes against known science fact, it is science fiction, which means here, where we have mass spread of paranormal and supernatural visions, weird alien creatures that may or may not exist, etc. it nails every subcomponent required to be a scifi, however in true genre senses, it is a thriller. But this site is a catch all because its a genre site, so its down to the element of scifi being present for it to be allowed. Which means this movie, with a scifi sub genre matching, belongs on this site with the xfiles and the dead zones, and the star wars, and the strange days. Even in cases where they "dissapear away" the story through psyhcological or "all in the head" answers, the problem is that comes down to perceptions of reality and the nature of what is real or not, which leads the door open to still classification as scifi. Its why its perfectly acceptable to have say, Videodrome as a scifi too, even though that's not its main purpose or indeed much of a classifier on that sole face value. I guess all that's left if to rewatch and make it definitive, but that unfortunately means sitting through this shite which i otherwise had no intention of doing.